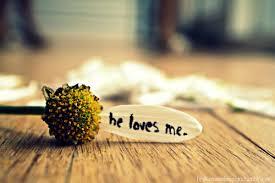 He Loves Me Enough To…. Each one of us has different fears, different issues, different pasts, and different baggage. God’s love is the healing balm. Feeling His love will cover you, embrace you, strengthen you, remind you, and overwhelm you. His love is why my grandpa’s favorite song was “No Regrets”. The lyrics “No regrets, I chose to follow Him” is actually written along the bottom of his tombstone and I can hear him singing it every time I read those lines…. No regrets because His love is what it’s all about.